Hi everyone, absolute first time writing a text post, so hopefully im doing this right. 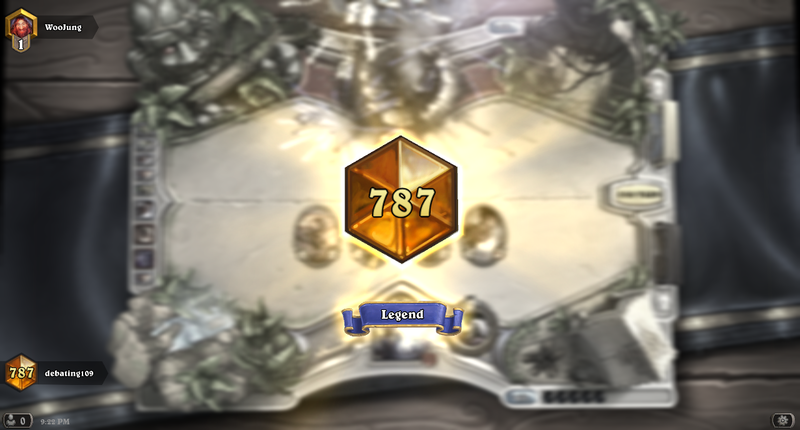 Zoo is incredibly strong right now and currently overpowered in my opinion with no counter decks in mass usage. In hindsight I really wished id tracked statistics, but from Wednesday night to 9pm Friday (Today) I reached legend from low Rank 8 with minimal losses. I’m not one to quote crazy win statistics but the deck in the current ladder climb has been atleast 60-65%+ win rate, with no appalling matchup’s beside miracle rogue and Ramp Druid (and even then I won 50% of games against said decks). Abusive Sergeant: This card is good to ensure more favourable trades and to activate the Nerubian egg. Personal preference, I felt that there were enough creatures to buff the egg and by itself the body is very weak, adding another wouldn’t be an incorrect call. Argent Squire: Great minion that sticks around after a board clear and provides an early minion not easily removed on turn 2. Is primarily used to trade up with buffs. The entire run I was debating whether replacing young priestess with another squire was the correct call, in the end I can’t decide, there have been situations where the priestess aided in winning a game and other situations in which id have preferred to have a squire. Adding another would not be incorrect. Elven archer: Added to ensure a definite point of damage to an opponents creature, great in the mirror matchup (in which there is alot on the ladder). I think 1 is the correct amount, by itself archer is weak, 1 in the deck provides useful utility. Primary combos are with knife juggler or owl. Young Priestess: Its primarily used for buffing a minion to annoy the opponent/survive aoe. This is the most questionable card in the deck, I’m still unsure whether its correct to run it or not, it is good utility, though after turn 2 its situational and RNG based. Dire Wolf Alpha: Staple, used to buff minions to provide favourable trades. Haunted Creeper: My 2nd favourite card in the deck, it provides a decent body and once traded provides even more value with the 2 1/1, that can be further buffed. In my opinion every zoo deck should run two. Incredibly powerful combod with knife juggler or defender of argus once traded. Ironbeak Owl: This was a meta decision due to the correct assumption that alot of ladder decks would run the nerubian egg. Suprisingly, the owl wasn’t usually used on the egg most of the time. For zoo I think running 1 owl is useful due to the utility it provides. It can neutralize a buffed minion, render the egg/haunted creeper (common ladder cards) much less powerful, or silence a taunt to get the last points of damage in. While the utility is useful, for the same reason as sergeant the body by itself is weak, in my opinion running 2 is overkill. Knife Juggler: One of the best cards in the deck, this card can and has won certain loss matches for me. Very good combo’d with the multiple deathrattle minions in this deck, causing multiple arrows. Nerubian Egg: This might require its own paragraph….. The Nerubian egg is a strong card but on the ladder iv’e seen so many people use this card incorrectly. It is almost NEVER a good idea to trade the egg off to get the 4/4 if your not killing the other creature. The egg is most useful to scare the opponent into making suboptimal plays as they can’t aoe. This goes for most of the other deathrattle minions in this deck, preserving the deathrattle effect will win you more games than blindly trading it off for the 4/4 as an aoe will never clear your board. Only worry about the silence effect if your playing against shaman or Druid, most players aren’t running silence for the time being. This card combos with any buffing minion and void terror. Shattered Sun Cleric: Buffing the Naxx minions and allow more efficient trades. Void Terror: Void Terror is Good, it deserves a place in the deck. The obvious combo everyone’s talking about is void terror+Nerubian egg giving you a 4-4 and 3-5 on turn 3. That only happened once for me, wierdly. It is a great way to activate the egg but the void terror is not limited to that instance only. If your playing against an opponent that you know is likely to have aoe and you have 1 health creatures on the board, sacking them into void terror can be a great play to ensure your opponent doesn’t get their value for free and your left with a buffed void terror as a threat. 1 I think is the correct number, you don’t want to keep sacking your creatures into void terror and as a topdeck its very bad. Less is more with void terror, you don;t want to sack value creatures to buff it, you sack creatures that’s value has mostly been spent into it. Dark Iron Dwarf: provides a solid body and allows a minion to trade up, egg activator also. Defender of Argus: Great card with the new deathrattle effects, best combo ive found is with the haunted creeper once its deathrattle occurs, turning 1/1s into 2 2/2s. Doomguard: Staple, strong body. It is usually incorrect to play doomguard on turn 5. If going second the rules still apply, mulligan for 1 drops, you are most likely going to get a good 2 drop in this deck. In my experience without knowing absolutely you have the cards in hand to buff it, egg on turn 2 is very weak, especially against the mirror. I generally traded egg off unless i had activators or the dream Nerubian egg turn 2> Void Terror turn 3. You want to trade for their minions if the trade is a good value, do not activate their deathrattle minions unless you can deal with them, allow them to activate for you, while this might slightly screw you sometimes, you gain the tempo advantage usually. You want to aggressively push for board control, if you lose board control with zoo the game can snowball out of your control. Be mindful of these cards and construct your board to ensure your opponent cannot get max value from these cards. Addendum: This deck has proven extremely good in a mirror matchup with other zoo variants making it a good deck for laddering currently. The meta is adapting and I have seen aggro variants of Shaman, Handlock and Ramp druid to combat the influx of zoo decks. I hope this post was helpful, first time ever attempting one. I’m dyslexic but have attempted to make the grammar readable, I’m happy to edit anything that’s incredibly annoying.